A traditional fisherman sweater with a feminine twist, lobster(woman) is restyled for the growing number of women involved in the trade. A scooped neck replaces the customary turtleneck, and the bodice is slightly fitted and elongated to show off a feminine silhouette. Lobster is worked in one piece from the bottom-up, with the body and sleeves knit separately and joined at the underarms. It is shown here in Swans Island Worsted,100% organic merino wool. It is amazingly soft, making the sweater wearable with nothing underneath. 23 stitches/32 rnds = 4 inches/10cm in Diamond Pattern. 22 stitches/32 rnds = 4 inches/10cm in Twin Rib (slightly stretched). The body and sleeves are worked in-the-round from the bottom-up and joined at the underarm. Then the raglan yoke and collar are worked. This sweater is designed to be fitted at the chest and hips. The Twin Rib has more give than the Diamond Pattern, so the body will pull in slightly. If you wish the sweater to be loose fitting all over, make one size larger than normal, but note that the difference between sizes is greater for this sweater than for most of my patterns. 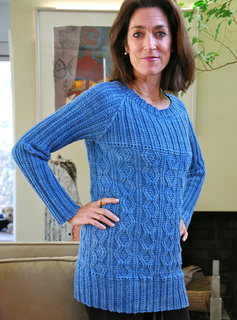 The length of the sweater can be adjusted, as desired, by working fewer or more Diamond Pattern repeats.